Description of "Marrying A Manglik"
A regular engineering student, Omkar Sharma, is faced with the oldest problem in love marriages when he falls in love with a Manglik, Ridhima. Bounded by moral obligations towards his parents and pulled towards love of his life, Omkar is forced to choose a side. The only positive thing he sees is his best friends, but the modern day avatars of Rahu, Shani aand Ketu had only one objective, to complicate the miseries of his life by their ingenious pranks. The entire world seems to be tumbling on Omkar's head and he has to find a win-win situation for everybody...FAST !! 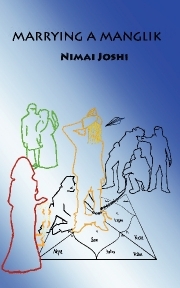 After critically acclaimed success of dark yet thought provoking first novel "The forged Genius", Nimai Joshi comes up with witty and humorous comic novel based on the true events that happened with his fellow mates from the batch of Metallurgy 2007, PEC. Currently working with State Bank of Patiala, Nimai Joshi draws his inspiration from the belief that "Reality is an exaggerated fiction". Reviews of "Marrying A Manglik"
I was reading "The Oath of the Vayuputras" when I got this book "Marrying a Manglik". I started reading this book and after completing it I don't feel like going back to "The Oath of the Vayuputras" because I am finding it boring now. I loved the concept of "Marrying a Manglik" and the lesson that can derived from it..Holding on to your love can solve big problems..! Keep writing Nimai..Way to go! All the best! Witty and romantic.. exactly opposite of the earlier book "The Forged Genius"
waiting for the next one... CHEERS !!!! !